Once all 8 are awake, the dawn of a new era will be at hand... and YOU (the Hero), will regain ALL of the powers that have been stripped from you! Our Loremasters have been collecting stories, tales, and rumors of the Elemental Titans since the Council of Loremasters was formed so many centuries ago. Though most of the Loremasters were slain in the months after the Queen of Monsters rose to power, one - Loremaster Maya - still travels with you, and keeps the old tomes close at hand. "...After constant warring, the Elemental Avatars wanted to stop their destruction, to create a world of elemental harmony. They came to Lore, making alliances and shaping the rock of the barren world anew. The world of Lore itself wasn’t enough to ensure the shaky truce between the Avatars, though. 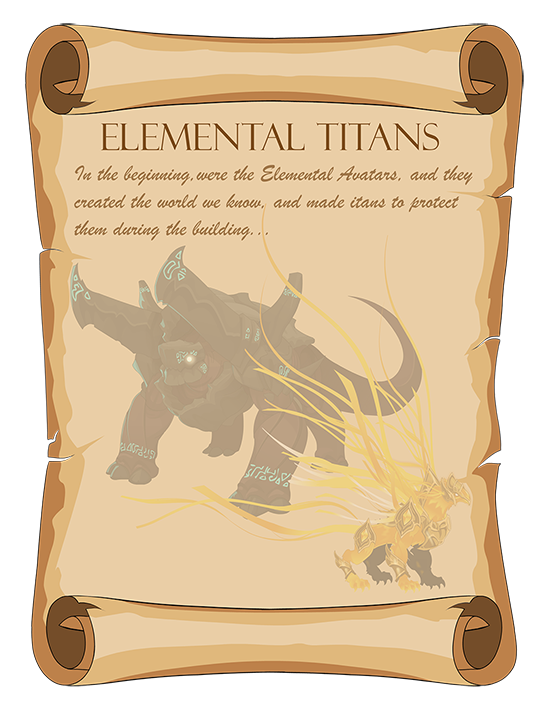 As the Elemental Avatars collaborated on the restoration, they created elemental guardians - the Titans - to protect them, each infused with the element of its Avatar: Earth and Darkness, Ice and Water, Fire and Light, and Wind and Energy. They were meant to protect the Lords as they labored… but not all of the Titans were content in their role as protector. They battled one another, fought with the dragons and crushed lesser races, and over time, the Titans too became threats, not protectors... until they were finally forced into slumber by the Avatars. And, in a last attempt to safeguard themselves and the world they had reshaped, the Elemental Avatars gifted separate races, other than elemental, with their power in order to gain their trust and service, and they created their Dragon guardians and the Champions who battled alongside them."